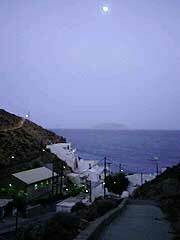 From a distance, Anafi, in the south-east corner of the Cyclades looks like no more than an isolated rock in the ocean. According to the myths, the Argonauts sought refuge from a storm on the island. 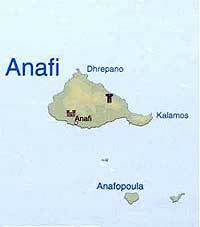 Anafi is about 30 kilometres west of Santorini. 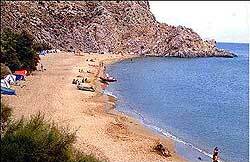 The island was covered by volcanic lava from the eruption of Santorini and very little grows on the island. A road leads from the picturesque harbour of Agios Nikolaos up to Hora, the only settlement of any size, built on a naturally amphitheatrical site in the centre of the island. The monastery of Our Lady 'Kalamiotissa' (18th century, standing in the precinct of a temple of Apollo Aegletus), the Venetian castle near Hora, and the church of St Athanasius are among the special sights.The beaches of Anafi, whether sandy or pebbly, are lapped by crystal-clear water. The local religious feasts are very lively, and so are the island dances. Agios Nikolaos is the island's harbour and a bus runs up to the Chora every couple of hours during the day and evening or visitors can walk up in about half an hour. From the Chora there are fine views of islets to the south. Above the Chora stand the ruins of a fortress built in the 15th century by Gugliemo Crispo. Along the south coast there are many excellent beaches. The main ones are Klisidhi, Roukounas, Katelimatsa and Monastiri.